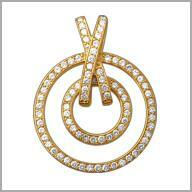 14kt yellow gold circle pendant with 1.7425 ct of diamonds. A circle of brilliance! Crafted in polished 14K white or yellow gold, this pendant features two circles, one smaller than the next and holding from an X design bail,all set in beads settings. The total diamond weight is approximately 1.7425ct with a color of G- H and clarity of SI. It measures 7/8" x 7/8" and has a bail measurement of1-1/2" x 1/16".